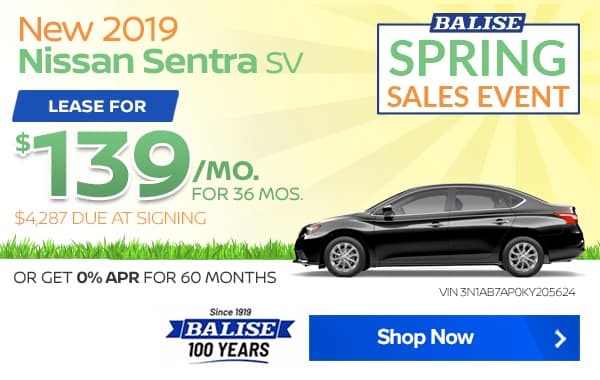 New 2019 Nissan Sentra SV with automatic CVT transmission (STOCK# N34489, VIN 3N1AB7AP0KY205624, MSRP $20,390) APR OFFER: 0% annual percentage rate financing for 60 months, $16.67 per month per $1000 borrowed. LEASE OFFER: $139/mo lease, 36 months, 12,000 miles/year, $4287 total due at signing (includes down payment, $139 first payment, doc & title prep, bank acq fee). Sales tax, title and registration fees additional. Includes $2125 NMAC lease cash. Based on selling price of $20,107. ALL OFFERS: All incentives to dealer, cannot be combined with other offers. Available to well-qualified buyers, not all will qualify. Offers end 4/30/2019. 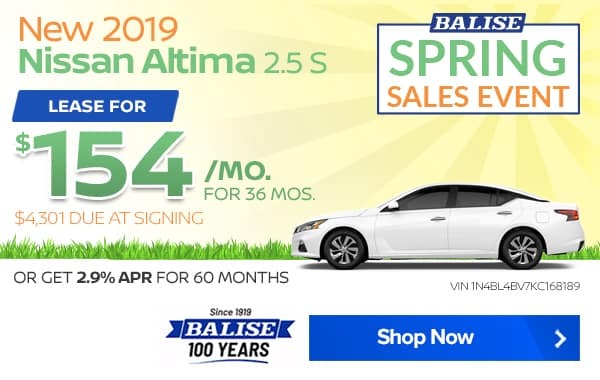 New 2019 Nissan Altima 2.5 S FWD with automatic CVT transmission (STOCK# N34699, VIN 1N4BL4BV7KC168189, MSRP $24,855) APR OFFER: 2.9% annual percentage rate financing for 60 months, $17.92 per month per $1000 borrowed. LEASE OFFER: $154/mo lease, 36 months, 12,000 miles/year, $4301 total due at signing (includes down payment, $154 first payment, doc & title prep, bank acq fee). Sales tax, title and registration fees additional. Includes $2725 NMAC lease cash. Based on selling price of $23,443. ALL OFFERS: All incentives to dealer, cannot be combined with other offers. Available to well-qualified buyers, not all will qualify. Offers end 4/30/2019. 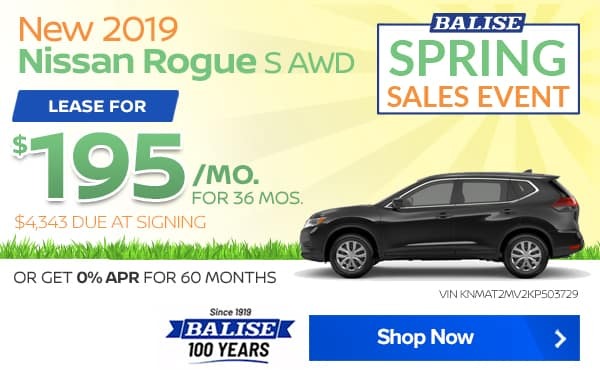 New 2019 Nissan Rogue S AWD with automatic CVT transmission (STOCK# N34663, VIN KNMAT2MV2KP503729, MSRP $27,595) APR OFFER: 0% annual percentage rate financing for 60 months, $16.67 per month per $1000 borrowed. LEASE OFFER: $195/mo lease, 36 months, 12,000 miles/year, $4343 total due at signing (includes down payment, $195 first payment, doc & title prep, bank acq fee). Sales tax, title and registration fees additional. Includes $2325 NMAC lease cash. Based on selling price of $26,480. ALL OFFERS: All incentives to dealer, cannot be combined with other offers. Available to well-qualified buyers, not all will qualify. Offers end 4/30/2019. 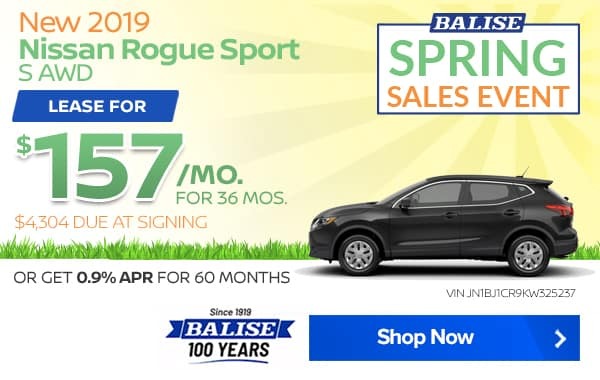 New 2019 Nissan Rogue Sport S AWD with automatic CVT transmission (STOCK# N34796, VIN JN1BJ1CR9KW325237, MSRP $25,485) APR OFFER: 0.9% annual percentage rate financing for 60 months, $17.05 per month per $1000 borrowed. LEASE OFFER: $157/mo lease, 36 months, 12,000 miles/year, $4304 total due at signing (includes down payment, $157 first payment, doc & title prep, bank acq fee). Sales tax, title and registration fees additional. Includes $2450 NMAC lease cash. Based on selling price of $24,073. ALL OFFERS: All incentives to dealer, cannot be combined with other offers. Available to well-qualified buyers, not all will qualify. Offers end 4/30/2019. 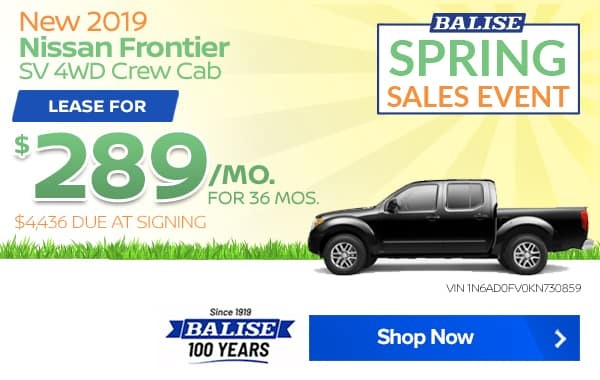 New 2019 Nissan Frontier SV 4WD Crew Cab with 4.0L V6 engine (STOCK# N34697, VIN 1N6AD0FV0KN730859, MSRP $31,405) $289/mo lease, 36 months, 12,000 miles/year, $4436 total due at signing (includes down payment, $289 first payment, doc & title prep, bank acq fee). Sales tax, title and registration fees additional. Includes $500 NMAC lease cash. Based on selling price of $30,505. All incentives to dealer, cannot be combined with other offers. Available to well-qualified buyers, not all will qualify. Offer ends 4/30/2019. 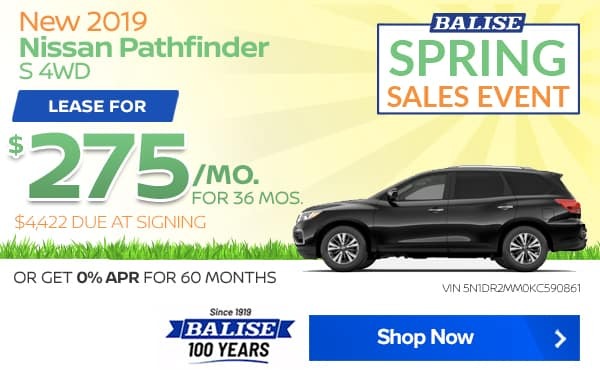 New 2019 Nissan Pathfinder S 4WD with automatic CVT transmission (STOCK# N34602, VIN 5N1DR2MM0KC590861, MSRP $34,390) APR OFFER: 0% annual percentage rate financing for 60 months, $16.67 per month per $1000 borrowed. LEASE OFFER: $275/mo lease, 36 months, 12,000 miles/year, $4422 total due at signing (includes down payment, $275 first payment, doc & title prep, bank acq fee). Sales tax, title and registration fees additional. Includes $3350 NMAC lease cash. Based on selling price of $32,978. 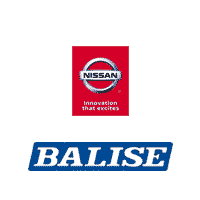 ALL OFFERS: All incentives to dealer, cannot be combined with other offers. Available to well-qualified buyers, not all will qualify. Offers end 4/30/2019.